4405 College Main is a bit in an odd place, an area that is both Bryan (technically) and Northgate (colloquially). Today, it's completely abandoned, but it wasn't always that way. The building was built in 1985 according to Brazos CAD and was divided into two suites. 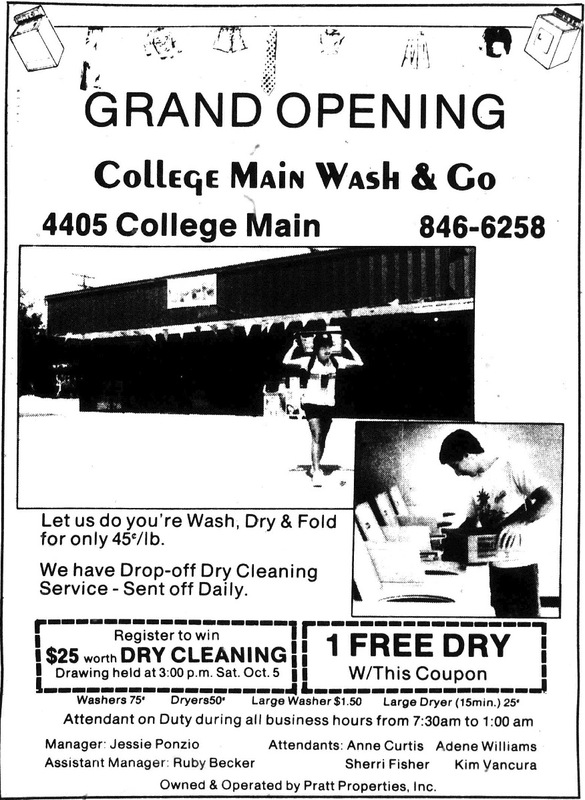 For years, 4405A was the laundry (College Main Wash & Go) as the main tenant and hung on for a bit until it closed at about the time they started rehabbing College Main (which to me was a pointless project since, because they closed off the vital portion between Patricia and University Drive, it went nowhere. 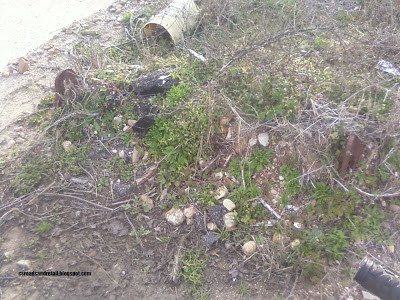 However, since it was Bryan's project, they can't help it if College Station botches their end of the road. By 2014, it was converted into the i-Stop convenience store but within a few years, i-Stop had shriveled up, leaving the center completely empty. While I don't have phone books for the late 1980s (except 1989) readily available, it appeared that before the more well-known Thai Taste (which occupied B for most of the 1990s), "Carrie's Kitchen" was at 4405B in the 1980s. Details on Thai Taste are still sketchy, but I seem to remember from reading on forum postings that Thai Taste closed in the mid-2000s on College Main, but the name was bought and it reopened on University Square for a few years. Then it became Vietnamese Taste (dunno when it opened, but it was around in 2006--this also kept the "Taste" part of the old sign). Vietnamese Taste closed in May 2012 (roughly) and reopened as "Vy's Asian Kitchen Cuisine" behind Taco Cabana a few months later. So far it's gotten decent reviews, but I've never eaten there (still, it was there for more than 5 years so it must be doing something right). 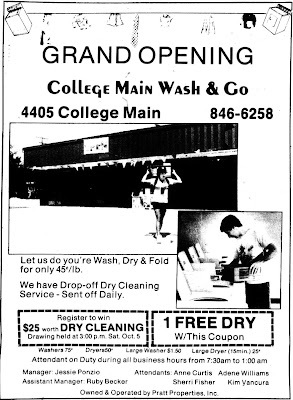 Updated August 2017, formerly "4405 College Main: Thai Taste, Vietnamese Taste, and a Laundromat". The rewritten article features a new photo, a new restaurant, new information, and a confirmed opening date. It also removes parts referring to then-contemporary articles. This has always been a building I've seen since my youth, operating as a business I can't remember anymore (it had six letters and appeared to be there for a while, given how faded it was) but originally, it was Wickes Lumber, operating since at least 1975 (likely built soon after the completion of the "West Loop"). Given the ad below, it seemed to be a full hardware store, even going with its own functioning railroad spur to bring in lumber directly. 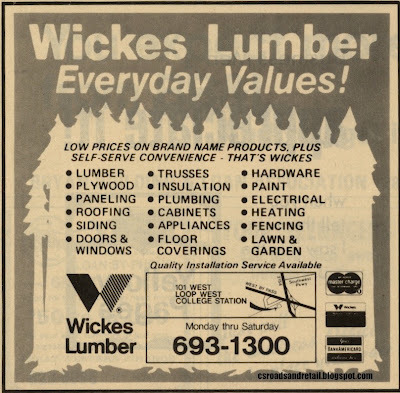 I don't know when Wickes Lumber went out of business...FundingUniverse seems to indicate late 1980s or early 1990s, which makes sense and then somehow later down the line, Wickes was bought and operates in the UK exclusively, but such a thing is out of the scope out of this article. You aren't missing much in terms of building variety. 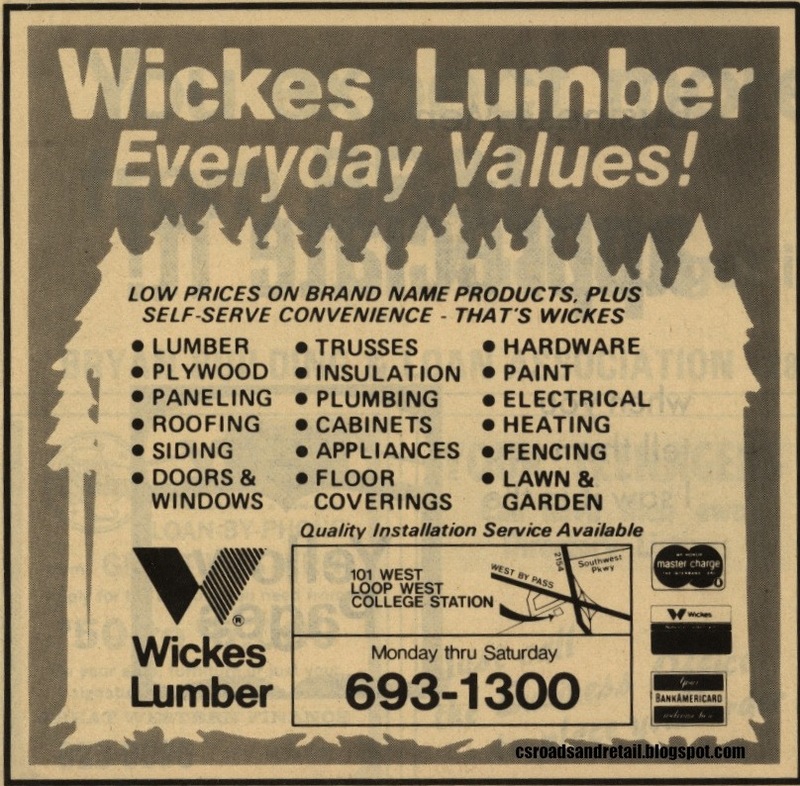 After the closure of Wickes in the late 1980s or early 1990s (as mentioned before), about two or three other businesses tried their hand at the building. There was that faded sign with six characters in the early to mid-1990s (as far as I know that was the first tenant after Wickes) and something else as well later (or two), until finally coming to Moore Supply Co. and their "Bath & Kitchen Showplace" (initially with a tiny sign) sometime in the early to mid 2000s. Sometime since this post was last updated (2017?) Bath & Kitchen Showplace renamed to "Facets". The surrounding buildings that Wickes had were all sold off (they were owned by Wickes--during the right time of day, you can see a Wickes Lumber "labelscar" on the Boral Bricks building). 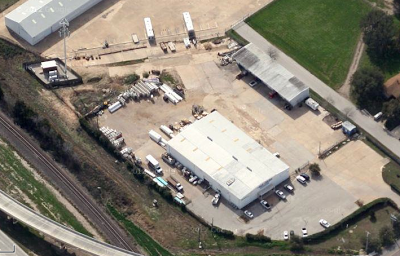 Brazos Valley Turf occupies the building to the right of it (has been there for years), and Boral Bricks is in the back (probably originally something else after Wickes). The addresses are all different...Wickes Lumber had been 101 West Loop, but the current addresses include Moore Supply Co. as 1530 Harvey Mitchell, Brazos Valley Turf as 101 N. Dowling Road (which is strange since the same address is shared with Living Water Pottery), and Boral Bricks ("Boral Bricks Studio"?) is at 95 N. Dowling Road. Brazos CAD was no help in trying to get any information on the confusing addresses of these things, nor any old phone books. The only things that I gleaned from my resources was that Brazos Valley Turf opened in the late 1990s (which makes sense with what I remember), but even before BV Turf opened, the address of Country Grocery was 101 A N. Dowling Road, which suggests that even back in '96, there was a second address for that. 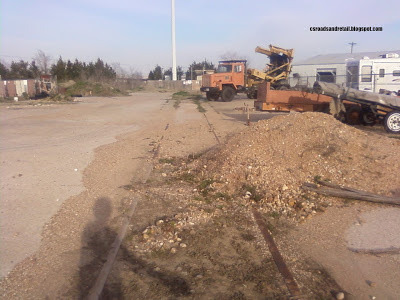 Finally, we have those pictures of railroad spur I mentioned before. It shut down around or before the untimely closure of Wickes Lumber, and a cell phone tower has been built on the site, but some of it remains today. 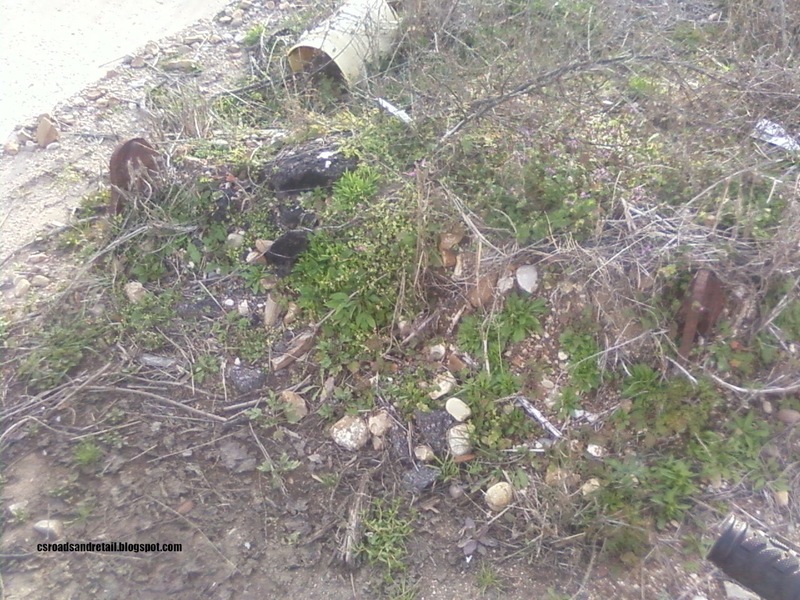 These pictures were taken in June 2010 with my then-new cell phone camera, and I'm excited to show these, even if they are a bit low quality. It had been around since at least 1975, so it was likely built soon after the completion of the "West Loop". UPDATE OCTOBER 2015 - Added in info about when pictures were taken and took out mention of then-contemporary blog happenings. UPDATE MARCH 2019 - Minor updates to account for some changes.